Also, I have made a youtube, check it out! I play through games like Undertale and Never Alone; I also do reviews of tv shows and toys (Steven Universe)! If you are from deviantart, leave a comment on a video letting me know who you are! Oh dA, how I've missed you, lol! Haven't been here in a while! More Gemsonas! Some of you who have been following me for a while have probably seen about half of these concepts already in my earlier gemsona post. Obviously, most of the ones that I’ve designed prior have changed. Since Opal and Peridot have popped up in the show, I’ve changed their names. I think I honestly had a harder time picking the names of the gems rather than designing them, lol. If you want to make your own gemsona, but having thinking of gems, check out Gem Select | Gem Hut | Minerals by Name. When you’re done, show your creation off at gemsona-hq too, a great archive of gemsonas on tumblr. amazonite has a cool design. I would like to see an ugly gem for a change. Good place to still look for gem ideas, even if a lot have been shown and named. (Translation): and you didn't add ME! YOU WILL PAY DEARLY FOR THIS!! Nah, it's cool. I really don't care either way. Sapphire here looks like a defective tall aquamarine, not being rude or anything. i dont like bixbite and emerald, the rest have awesome designs! 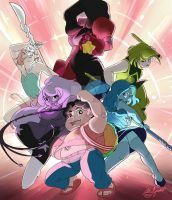 I remember when I didn't know yet what Steven Universe was, and this was one of the very first related images I ran into. I found it a weird concept, gems with a humanoid form. Then I started listening to the songs on Youtube. At first the background music sounded weird to me, it certainly wasn't like anything I had listened to before. I listened to about 50 songs on Youtube and read some articles before I decided to start watching episodes. By that point I knew some significant things that happened in later episodes. I think if I had just watched the pilot without any prior knowledge, I would've thought that the characters are ugly and Steven's character is abrasive and not relatable. However, I wanted to see how it would develop, and I certainly liked the subsequent drawing style more than the pilot. Now I've seen every episode that has come out so far and am a total fan. So thanks for introducing me to the concept of Gems. Your Obsidian OC is pretty "gneiss", you should check out mine lol. Obsidian looks like a Samurai Jack character. The gem Sandstone is the girl or boy ? Behold, someone put this on a pillow and is trying to sell it on amazon. The last 5 = Best waifus. are you sure about Hematite? My most favourite Gemsona of yours is Amazonite, I'm currently learning how to draw her. bio- a mighty automaton constructed by the first gem empire, an ancient civilization that pre-dated the great diamond authority but was quickly destroyed by their superior technology and numbers due to the diamonds' injectors, lonsdaleite was built by the last who were loyal to the first gem empire, and he was built to destroy any home world gem which stood in his path, even the diamonds themselves, but lonsdaleite's indestructible core activated too late and he awoke in a barren wasteland which was once the capital of the mighty gem empire, alone and without purpose, lonsdaleite decided to roam the galaxy using his warp core, which was constructed similarly to the warp pads of the diamond authority, so he now uses his powerful warping abilities to explore strange new worlds, to seek out new life and new civilizations, to boldly go where no gem has gone before!!! Looking back, these gemsonas are suprisingly outdated. What is up with Ruby? 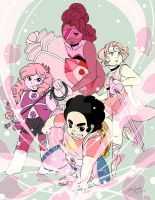 We already know what a Ruby is supposed to look like along with a Sapphire as they look completely different than how they should look in the TV show. These were made way, way, way before we saw Ruby and Sapphire in the show. Do people even pay attention to date anymore?